They’re fiery and dangerous, or they’re clownish and weak. They’re total geeks in public, but they’re wild in the bedroom. They don’t have souls, so they’ll steal yours. The list of myths and stereotypes about redheads go on and on, showing just how stigmatized people with this unique phenotype really are. But all of the joking about the red-headed step-child aside, it turns out that our ginger sisters and brothers really do have a special set of attributes that their blonde and brunette counterparts don’t. While some of them are a bit predictable, other aspects really are quite fascinating — even advantageous at times! So what’s so special about our redheaded friends? What is it that makes their hair so crimson and their skin so pale? What mysteries are contained within their fair, carrot-topped bodies? Let’s go ahead and set the record straight, so here’s the go-to list for the truth about redheads. Being redheaded isn’t the same as being a blonde or a brunette, according to science. That’s because our ginger baes are different on a genetic level, which may be why it’s so hard to fake, at least convincingly. In fact, gingers specifically have a mutation on their MC1R gene, according to the National Institutes of Health. So now you can tell all of your redheaded friends that they’re legit mutants. So what does that mutation do, and how did it give Reba McEntire and Jessica Chastain those swoon-worthy locks? In a nutshell, it increases the amount of the red pigment (phaeomelanin) that gingers have, and decreases the amount of the darker pigment (eumelanin) they produce. That’s what causes redheads to have fairer skin, freckles, pale colored eyes and, of course, red hair. That’s also why redheads have to be careful in the sun, as they’re more sensitive to sunlight due to the lack of eumelanin. Believe it or not, redheads account for only two percent of the population, worldwide, according to Red: A History of the Redhead by Jacky Colliss Harvey. It’s more common in places like northern and western Europe, where redheads in turn make up higher percentages of the population. So for the most part, gingers are a rare breed, far outnumbered by the yellow and brown haired members of our species. The main reason gingers are so rare is because being redheaded is a recessive trait. That means that in order to be born with those famous crimson locks, both parents have to be a carrier of the gene. They don’t have to be redheads themselves, though, which is why gingers can sometimes be an unexpected surprise. If you’re a redhead with blue eyes, you’re even more rare. The reason? Having blue eyes is also a recessive gene, according to Science Daily. Talk about a unicorn! 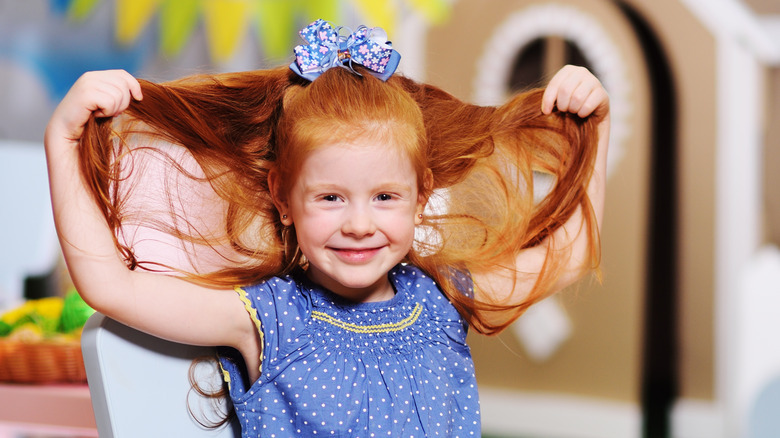 Although redheads are only a small fraction of the world’s population, they’re over-represented in television commercials, according to a study conducted by social and traditional media analysis firm Upstream Analysis. Company president Janet Harris discussed the results in an article she penned for the Huffington Post. Specifically, during peak television viewing hours, 30 percent of commercials will include at least one person with red hair. More often than not it’s redheaded ladies who are spotted — they’re twice as likely to be in a commercial than their male counterparts. And when you remove ads with no people in them from the equation, the percentage inches up to 33 percent. How’s that for evidence that everyone loves a ginger? Why are redheads in so many commercials? Some speculate that they’re super photogenic, which could be a factor. Others point to the positive effects that seeing the color red has on our bodies. More research is needed to know for sure, so for now we’ll just expect to see gingers on TV on the reg.